The beverage container recycling program was created in 1986 with the passage of Assembly Bill 2020. Consumers pay California Redemption Value (CRV) when they purchase beverages from a retailer, and receive CRV refunds when they redeem the containers. This is a statewide program administered by CalRecycle. More information about the program is available on the CalRecycle website. Beginning in January 2016, many of the recycling centers throughout California have closed, resulting in long lines at the remaining recycling centers. For example, in San Luis Obispo County there should be at least 10 additional recycling centers. CalRecycle is aware of this problem and is working to resolve it. Find a SLO County CRV recycling center near you. 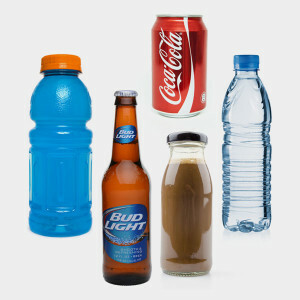 Many beverage containers are eligible to be recycled for cash at a certified recycling center. CRV, or California Redemption Value, returns 5 cents for containers less than 24 oz. and 10 cents for containers larger than 24 oz. Most beverages containers other than milk, wine and distilled spirits are subject to CRV. This money is added to the price of the beverage when you buy it. You get it back when you bring containers to a recycling center. The CRV from containers placed in curbside or public recycling bins is claimed by the entity that collects them. Check the label to see if a container is eligible for CRV: it will say “CA Redemption Value,” “California Cash Refund,” “CA CRV” or “CA Cash Refund.” Aluminum cans are labeled on the top of the can, and plastic or glass containers are labeled on the side. You can bring up to 50 aluminum, 50 glass, 50 plastic and 50 bi-metal CRV containers and request to be paid by count. Otherwise, you will be paid per weight. Inform the site attendant of your load content and how you would like to receive payment before you hand over your load. Recycling centers are required to comply with this request. Recycling centers are not owned or operated by the State of California. Days and hours of operation are determined by the recycling center operators and must be posted at each center. Centers are required to be open at least 30 hours per week, five days a week, and one weekend day. If you would like to report a recycling center closure or file a formal complaint regarding a certified recycling center, please contact the Department of Conservation at 1-800-RECYCLE or file a complaint via email.